January 20,2017: Yes bull meat eaters crying against mistreatment towards bull taming sport in Tamil Nadu. Of course cruelty to bulls should be stopped. But disbanding the bull meat industry could do better good to stop cruelty. 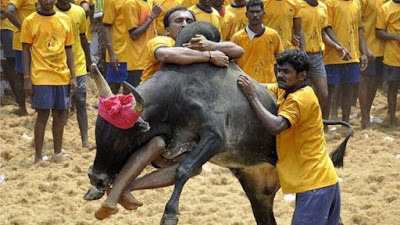 Shut down units of Meat Products of India and mass murder of cows, bulls and goats during religious festivals first and then come and preach us about animal rights.At least the bull survives and are well fed after the ancient barbarian bull taming sport of Jallikettu. Brave men needed a podium to prove their mettle in the ancient times.If we stop this, the cruelty will stop, so does the local tamil brave men who would join Indian Army, Police or Criminal Gangs. Indigenous breeds of cattle can be bid good bye. Because bull's permission is not taken before subjecting it to torchure.It is being fed up and allowed to grow to a healthy beast so as men could tame it in the sport. 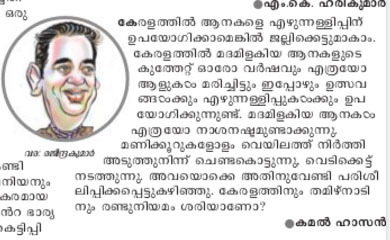 I believe kerala's thrissur pooram also will suffer defeat in Supreme Court .Same PETA is spending dollars in Supreme Court to stop Thrissur Pooram and elephant usage in temples..
January,8, 2017: Last year I was against it.This year I feel it is an adventure sport like Spanish bullfighting. 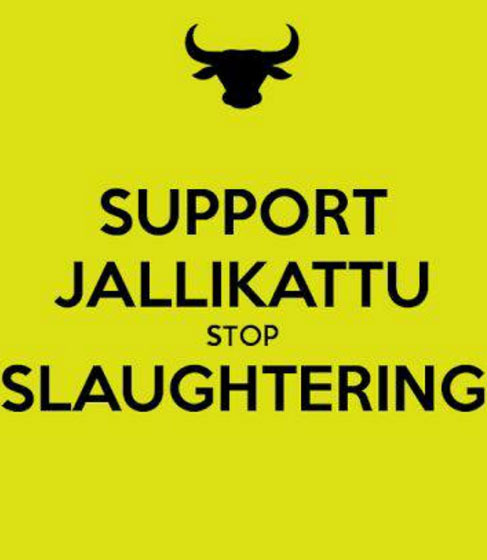 I condemn both.But for building brave men from tamilnadu , jallikkattu was an avenue.Improve the facilities, stop cruelty against bull and safety arrangements can be thought about.The liberals who support slaughtering and enjoys Spanish bullfights turns themselves in to animal lovers on jallikattu day.They regain their true nature on bakrid and other festival days when mass slaughtering takes place.